** Should posses Doctorate of Medicine (DM) or Magister Chirurguie (M.Ch.) or equivalent with three years experience. Senior Residency period will be counted towards experience, physical and medical standard. ** Candidates should have Degree in Allopathic System in the first or second schedule or Part-II of the third schedule. ** Should possess Post Graduate Degree with one and a half years experience / Post Graduate Diploma with two and half years experience in the concerned speciality. ** Candidates should have medical qualification of allopathic system in the first or second schedule or Part–II of the third schedule. 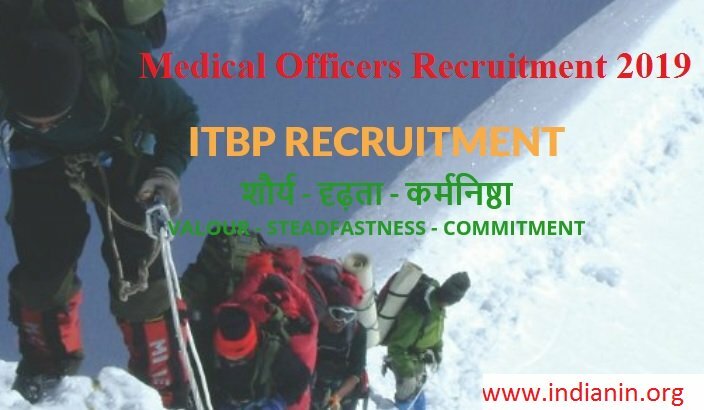 Candidates can apply online through the official website of ITBP. ** Admit card will be sent to their registered e-mail ID. ** A total of 200 marks are allotted to test the general knowledge and ability of the candidates in interview. ** Selected candidates who attend the interview will be required to undergo medical examination. 1. Candidates who are declared unfit in medical examination, may submit an application for re-medical examination with a duly filled Medical Fitness certificate along with Medical Re-Examination Fee of Rs. 100/- within 15 days from the date of rejection. 2. RME fee should be prepared in the name “DDO, Directorate General, ITB Police, New Delhi”. (iii) Candidate possessing good mental and sound health and free from any physical defect. (iv) Candidate must not have knock-knees, flat foot or squint in eyes. a. Candidate on appointment is liable to serve in any part of the country or abroad. b. Candidates shall be required to serve the Force for a minimum period of 10 years. If any officer, wants to resign from the service before the expiry of 10 years, he/she is required to refund a sum equal to 03 months pay and allowances or the cost of training whichever is higher. c. Every candidate appointed has to be a probation period of two years. d. Selected candidates after appointment will undergo basic training. e. Person who has entered into or contracted a marriage with a person having a spouse living, shall not be eligible for appointment.